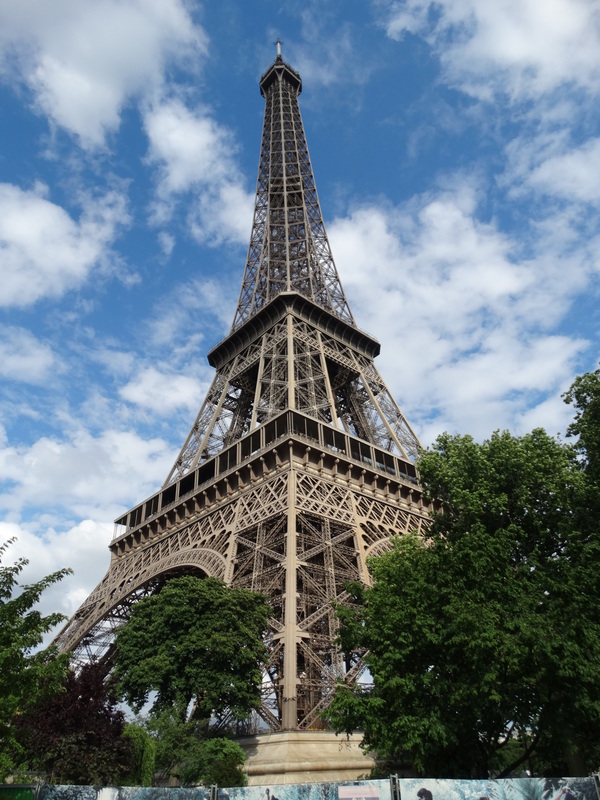 I have just returned from our adventures in Paris and am absolutely shattered- if only from driving a massive van clearly not designed for girls! The van we took this time was massive- we needed a crew van because Steve joined us on our expedition and a transit only has two passenger seats. If I was worried about driving the transit-that was nothing compared to this beast! 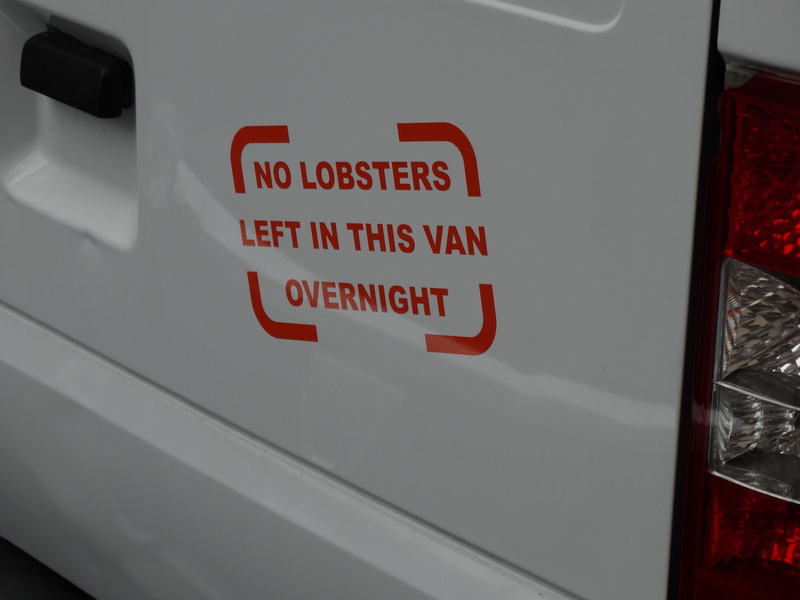 I hired it from a company called lobster van hire! Who knows what kind of trouble we’d have been in without this sign on the van! The van was ok to drive but being a girl with small feet I found it incredibly uncomfortable to drive because I couldn’t rest my heel on the floor with my foot on the clutch, which really does your calves in! I will take this into consideration when I come to buying my own van! We got to Paris about 11pm and by the time we had met the guy who was to let us into our Parisian apartment for the next 4 nights (I decided this would be a better option with the girls and financially so we wouldn’t have to eat out every night- check out airbnb.com- you can rent peoples apartments/houses while they’re away and live like you actually come from that city! Steve’s neice put me onto it and I was really impressed!) it was about 11.30pm. 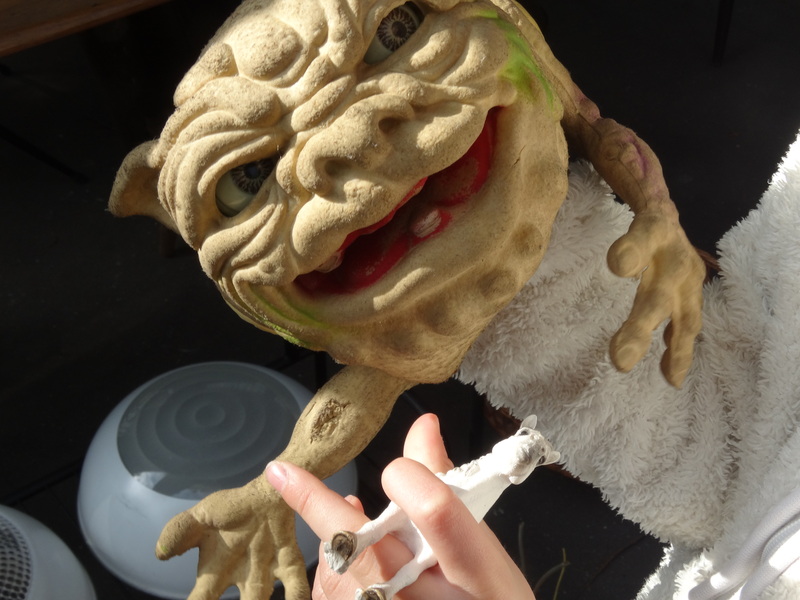 I then sent Steve out on a wine run while I unpacked and put the girls to bed with lovely clean teeth. About 15minutes later Steve bounds back in really chuffed with himself armed with McDonalds- I was really pleased when he went and got the girls back up again to eat Big Macs! 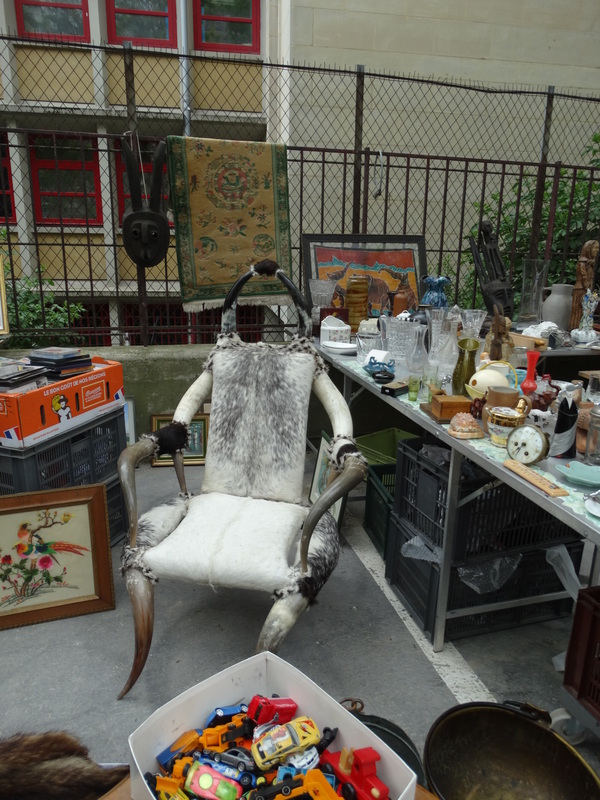 Very little sleep was achieved that night and I got us all up again the next morning at 6.30am to attack the first flea market on my list! 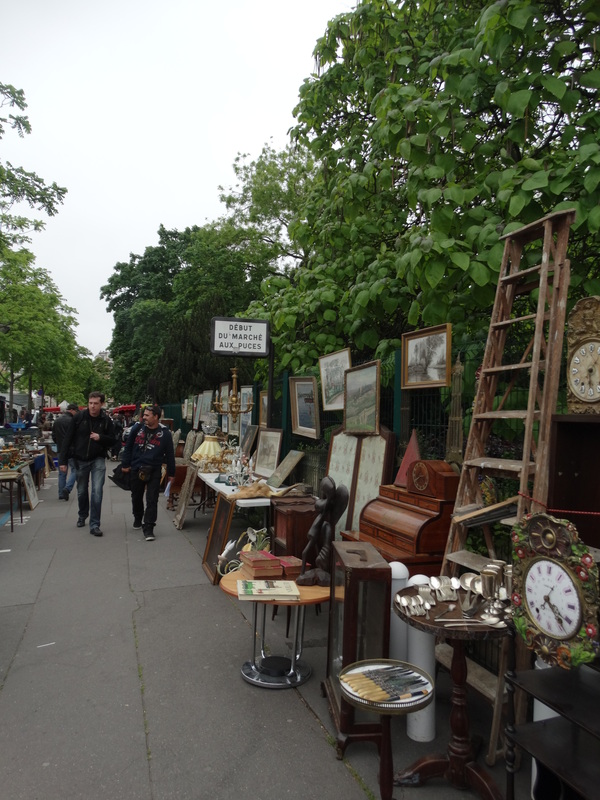 We checked out a market called ‘Marche aux Puces (French for flea market) de la Porte de Vanves. 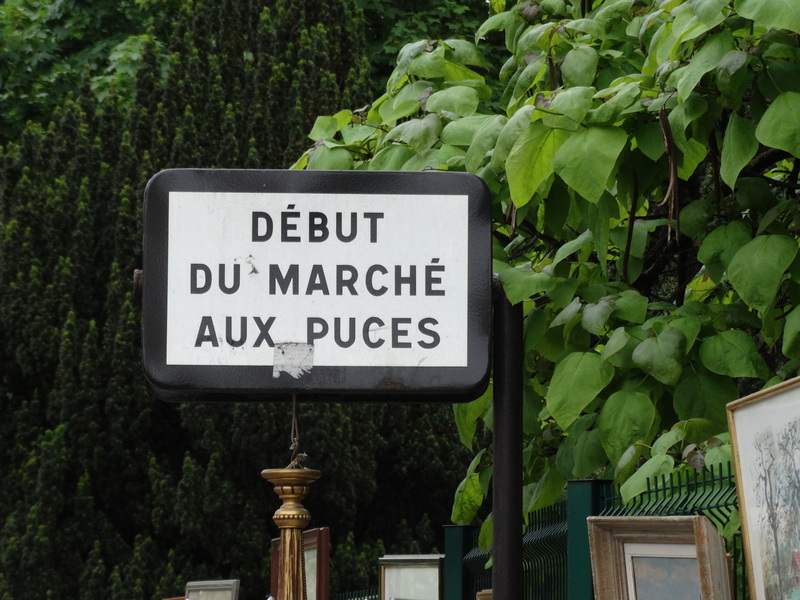 This market is south of the Seine. I let Steve do the driving (mainly because I was too scared to try to park the van! )- I have never seen anything like the roundabouts in Paris. They are huge and have a million different exits off them and no distinct lanes! They are a massive free-for-all. If you’ve got a weak heart I would definitely recommend never driving in Paris! 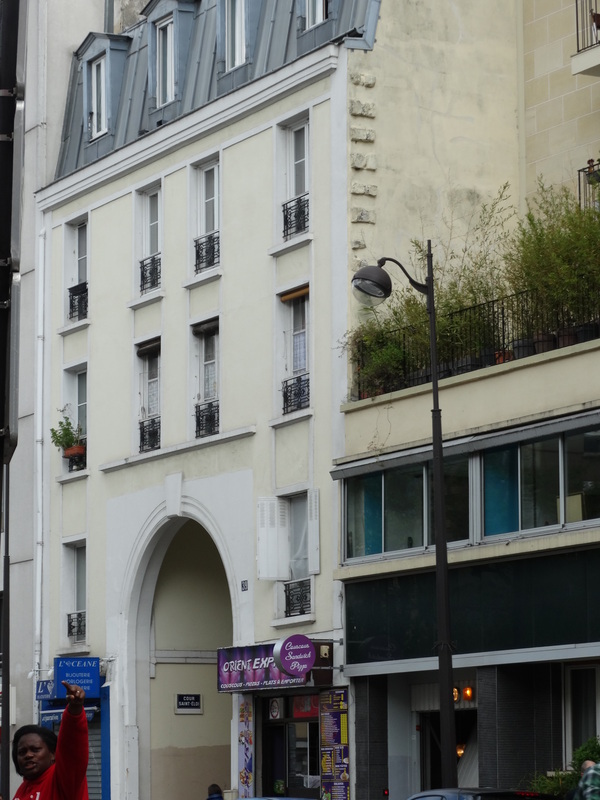 So arriving there in one piece (and not having to pay to park because all parking is free in Paris on weekends it appears) we began to wander. Shortly into our wander Steve pointed out there wasn’t a lot of furniture and I began to worry. 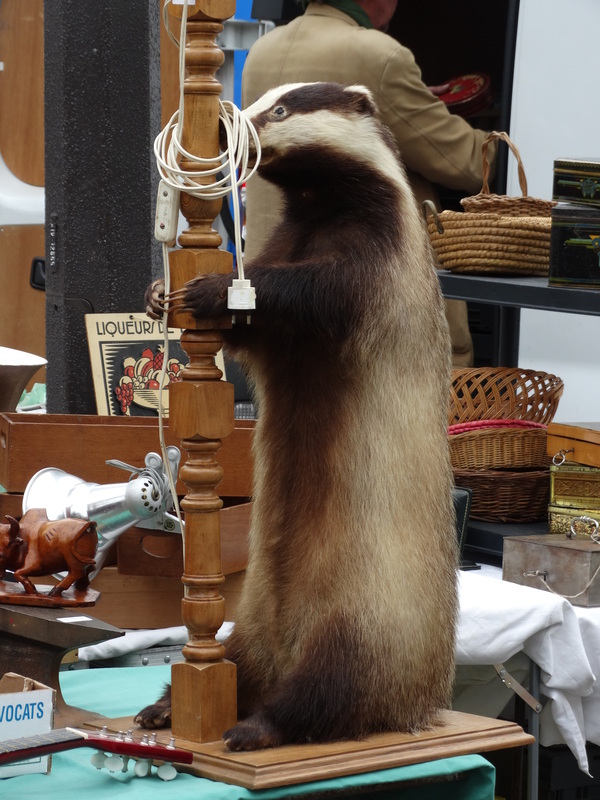 I had also written a little note next to this particular market on the market list had pre-prepared ‘?not good for furniture’ so it wasn’t boding well. Also any furniture I had seen and liked was crazily over priced. 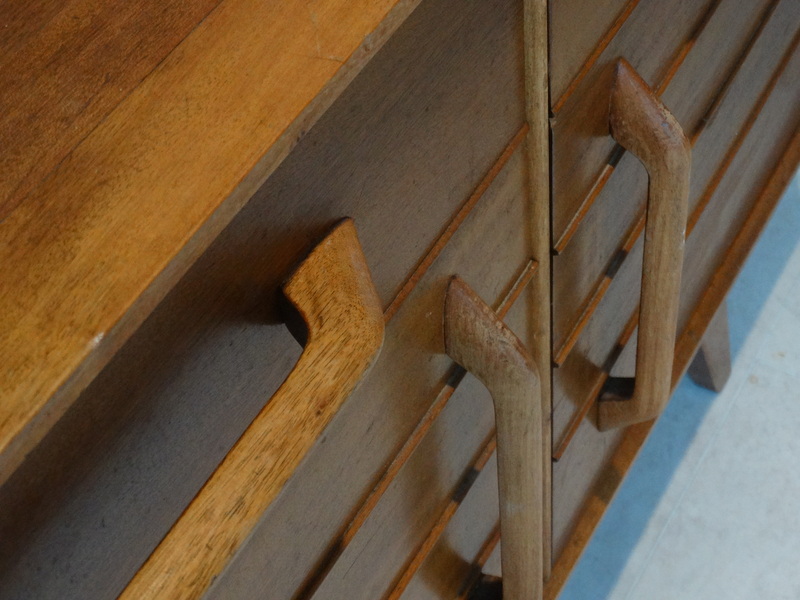 Anyway the further we delved the better things were- the market wasn’t huge (compared to the flea market in Tongeren, Belgium- you can read about it here) but spanned over a couple of streets and we found quite a few retro chairs and a desk plus a nice antique style oak wardrobe. I think overall this market was my second favourite of the trip. 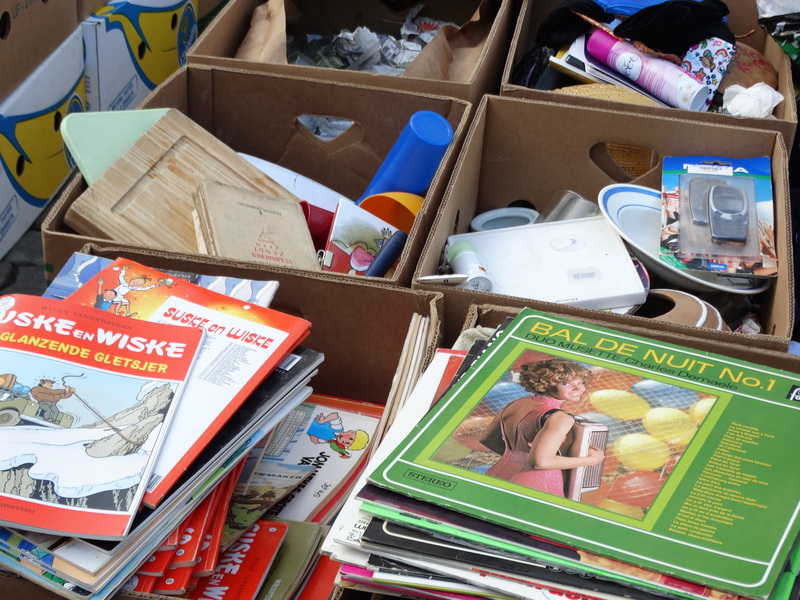 Although it’s not huge the content was pretty good, the atmosphere was good and you can find yourself some bargains if you delve deep enough. 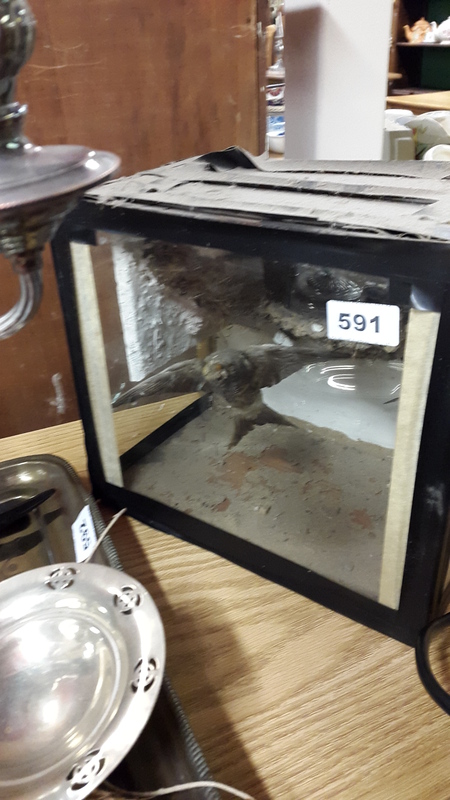 There were also some really weird and wonderful treasures to be found! These things caught my eye-I can vaguely remember them from my childhood-pretty sure my brother had one-any idea what they were called??? 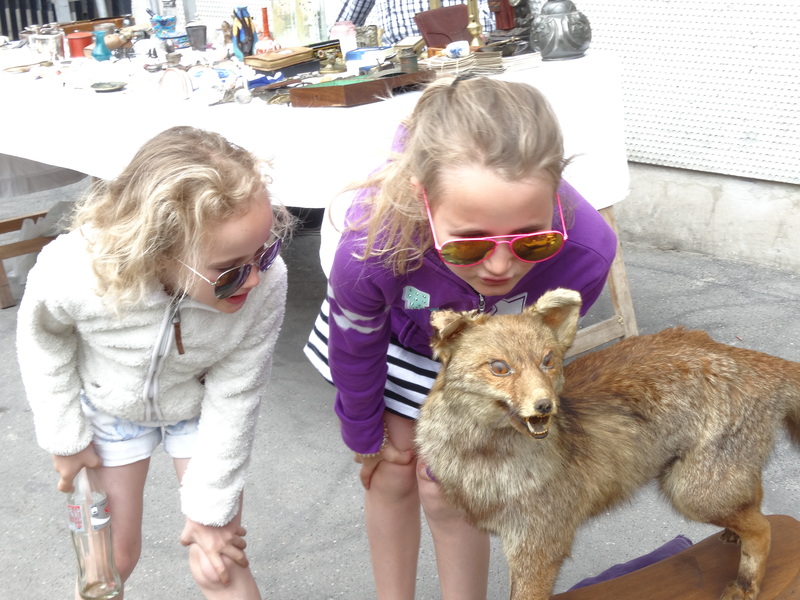 On day two we were en route to Marche aux Puces de St Ouen when we stumbled across a market in Vincennes. I did a bit of research to try to find out what the market was called but l’m pretty sure if was a market on purely for the bank holiday weekend. 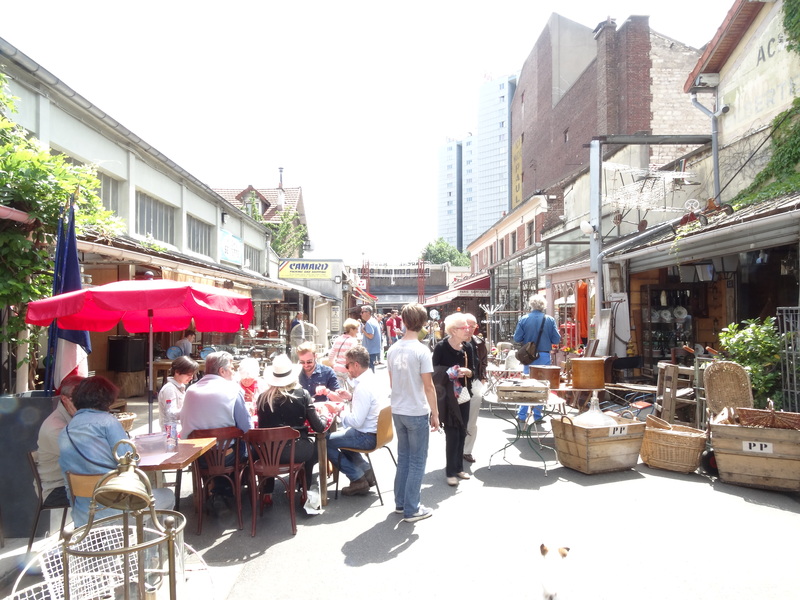 I think there is a market in Vincennes but it’s more foody and is on a Saturday and Wednesday. The one we stumbled across was really good. I bought a couple of retro leather chairs and by now was getting a lot more confident in the bartering and getting to grips with French numbers. I was fairly impressed with how much GCSE French I remembered. I have Mrs Howes to thank for that! 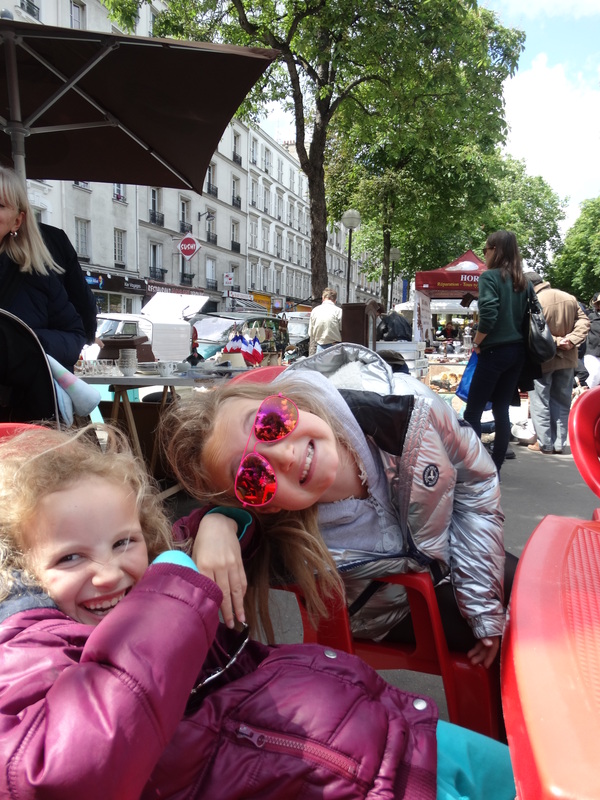 After we’d exhausted that market-or rather the market had exhausted the girls we headed on to the Marche aux Puces De St Ouen. 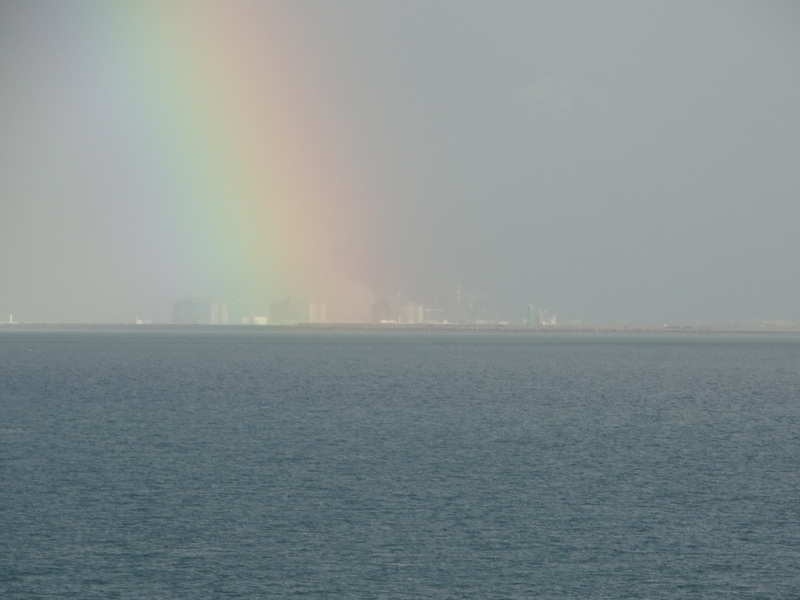 And I have never seen anything like it. It was HUGE! 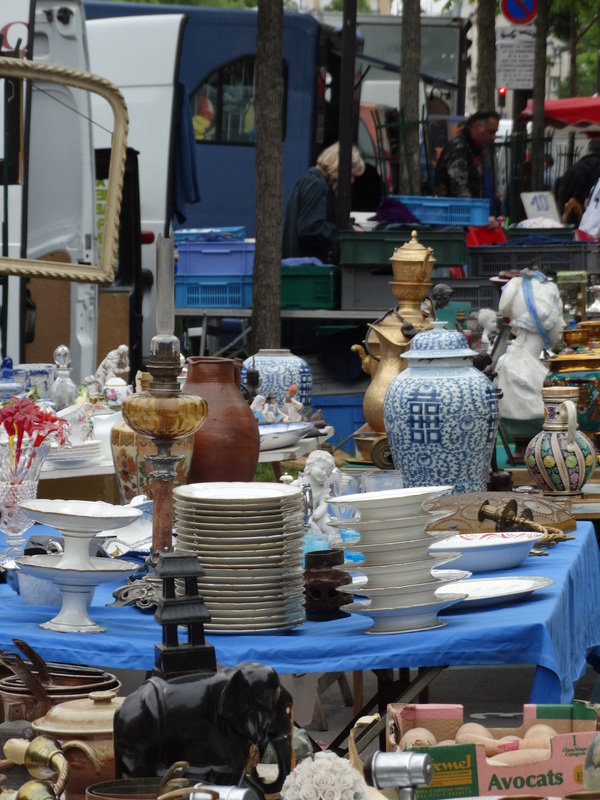 It was described online as Europe’s biggest flea market. I am not surprised-apparently there are 15 markets all in one. 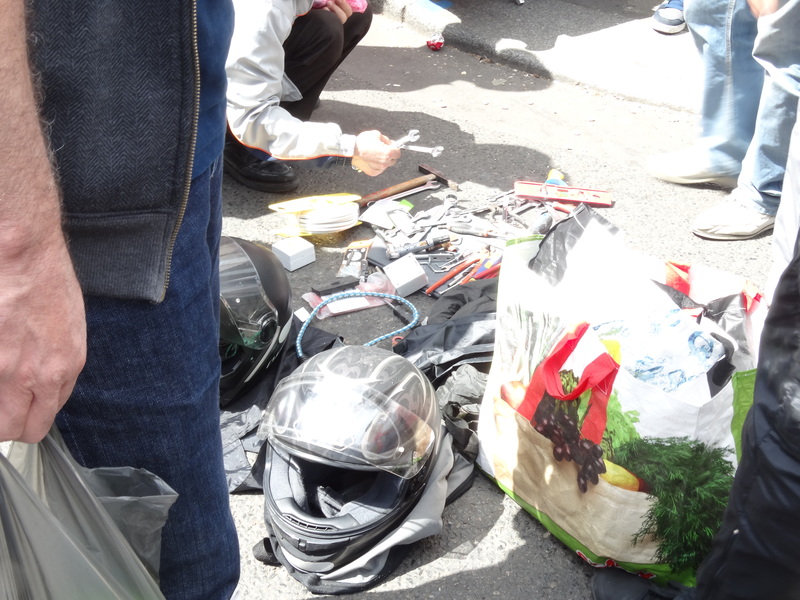 Each area of the market appeared to be very different. The first part we arrived was called Paul Bert and Steve described it as ‘Battlesbridge on meth’. 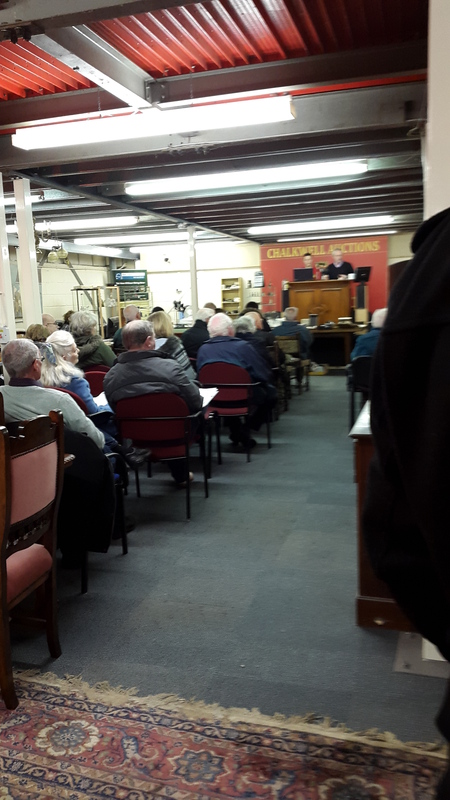 Anyone who ever visited Battlesbridge Antique centre in Essex will know that it is basically people selling lots of over priced junk! 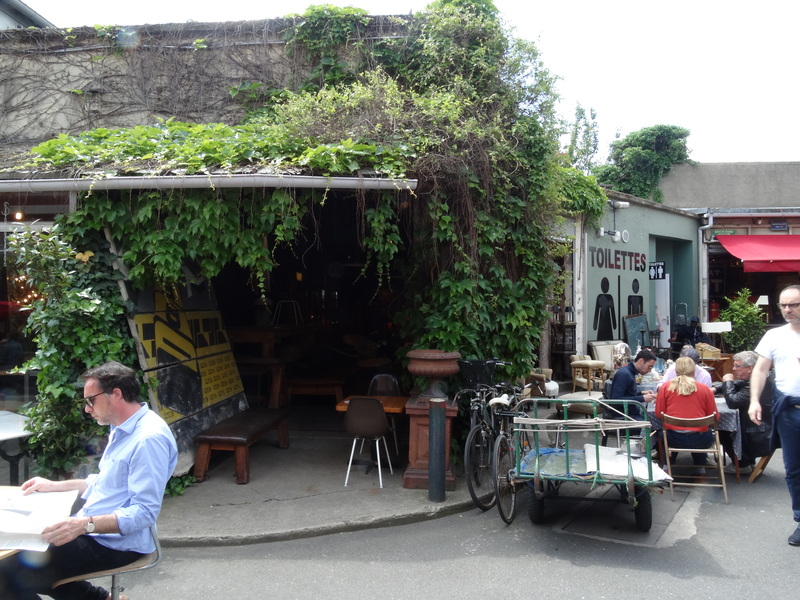 This place was like that except the junk was more extravagant and more outrageously priced. Worth a look though! On leaving that area we stopped for moules and frites. And the customer service was nothing I’ve never seen before! An American guy seated behind us complained that all his mussels were empty shells. The owner came out to speak to him and said that the mussels might be at the bottom of the bowl. The customer said that ‘no, they weren’t’ and so the owner took his bowl away and said ‘ok, goodbye’! The next area we went in was a slightly dulled down version of this and then we entered an area which was a little bit grubby and I think there may have been a few opportunist stall holders who had thrown down a bit of cloth and any old bits of rubbish they’d managed to put their hands to! 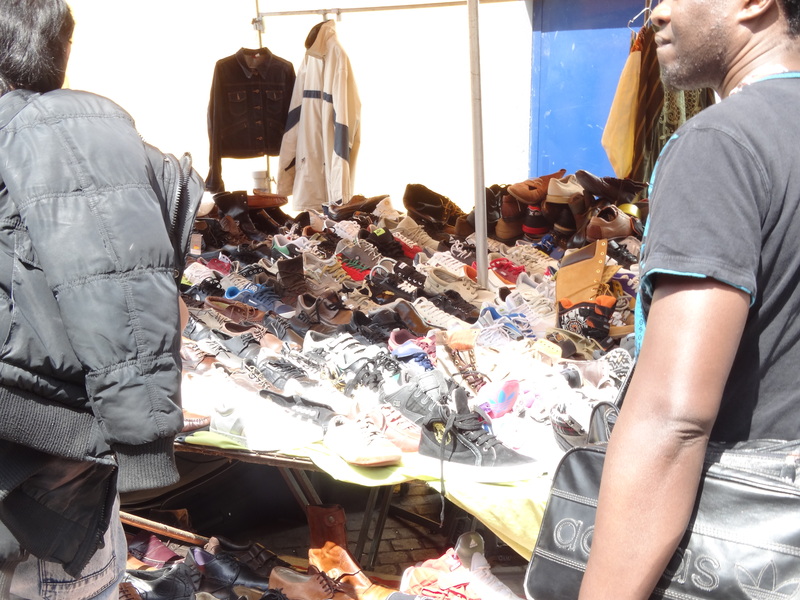 Then we moved onto an area which had loads of stalls selling tracksuits and trainers! 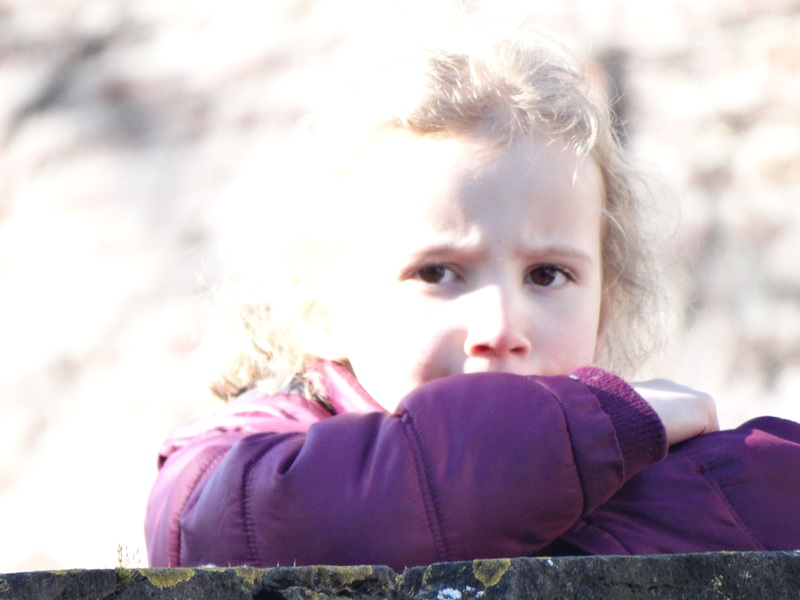 I’m sure had we have stayed and explored more we may have found some decent areas but I was feeling uncomfortable in the area we were in and the girls had certainly had enough. The reviews I’d read about this market weren’t great and I have to say I wasn’t keen! 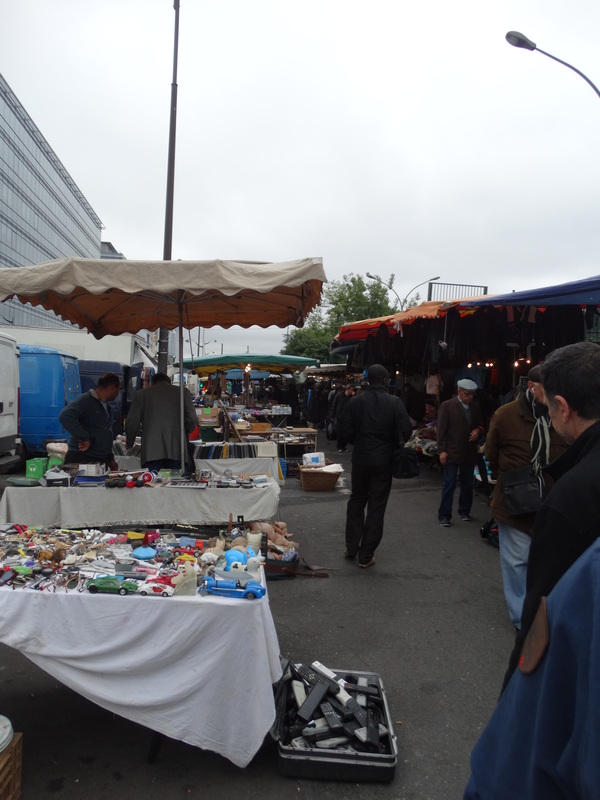 Our final market trip on the Monday was Les Puces de Montreuil. 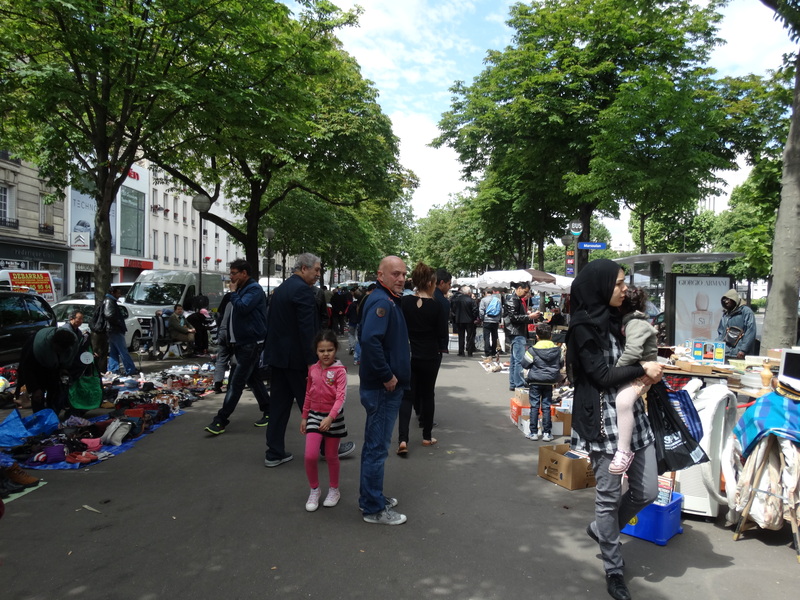 This was more of a market than a flea market. 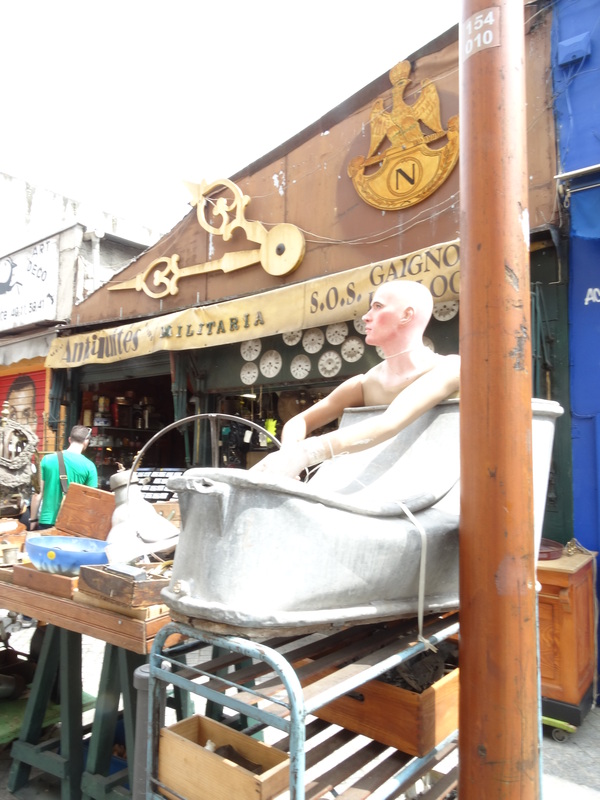 The first area we walked through was all ram shackle market stalls with all sorts of junk-it was quite unsavoury! 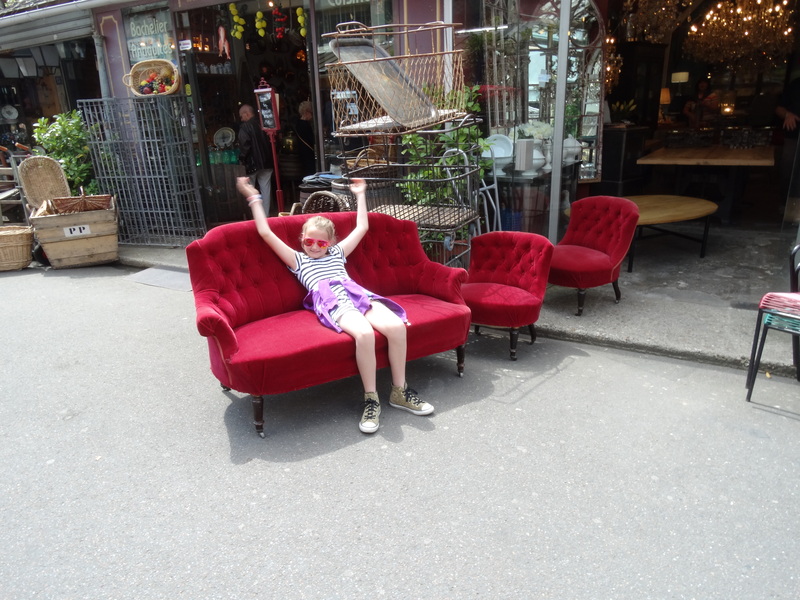 Then we headed down the road and found a beautiful chair. This however was the only stall selling furniture and this chair was the only nice piece! Moving further into the market it became apparent I was not going to find any thing of interest. 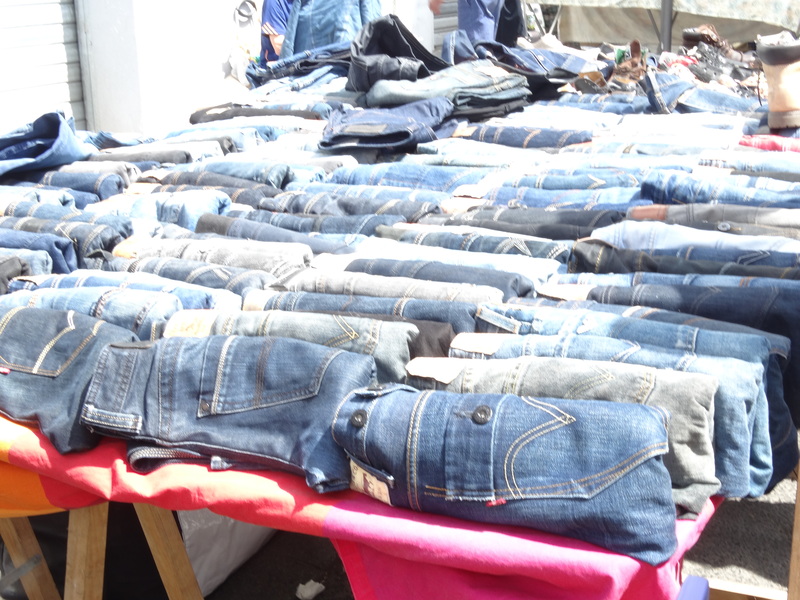 There were mainy stalls selling new but cheap and nasty clothes. One little gem though- I found a stall selling upholstery material at a price so good I still can’t work out how the stall holder makes any sort of profit! 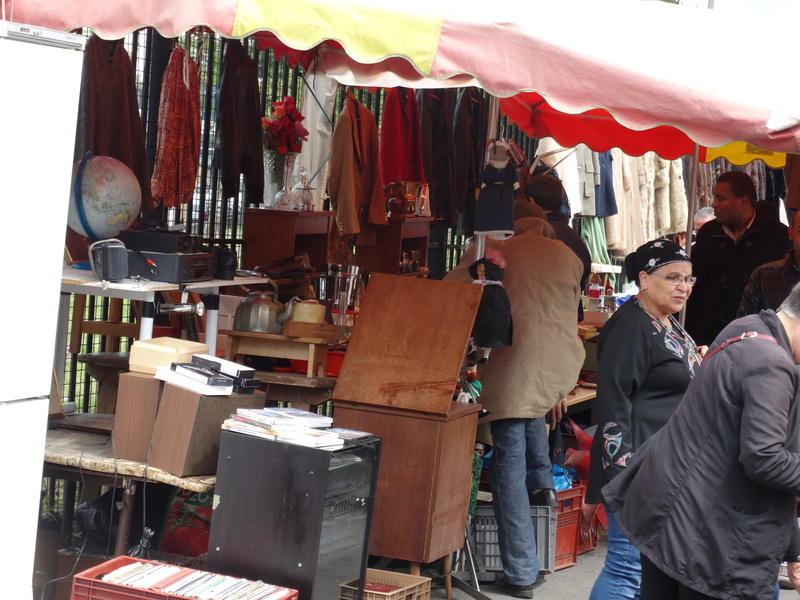 I’m sure there are many other flea markets in Paris but if I had to recommend one to go to if you like that sort of thing I would have to say the market in Vincennes was my favourite but since it’s not there all the time check out Marche aux Puces de la Porte de Vanves. Oh, and we did manage to squeeze in a bit of site seeing! Another early start but this time I fed the girls before we left for Brussels leaving them with one less thing to whinge about. 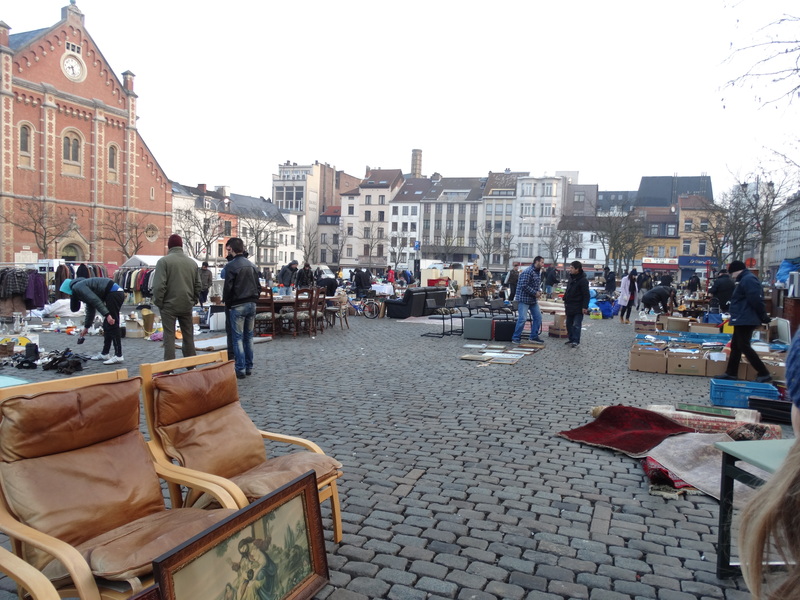 I checked and checked again that there would be a flea market in Brussels and we successfully found it with little fuss-even after some scare mongering from the hotel receptionist that there would be nowhere to park. 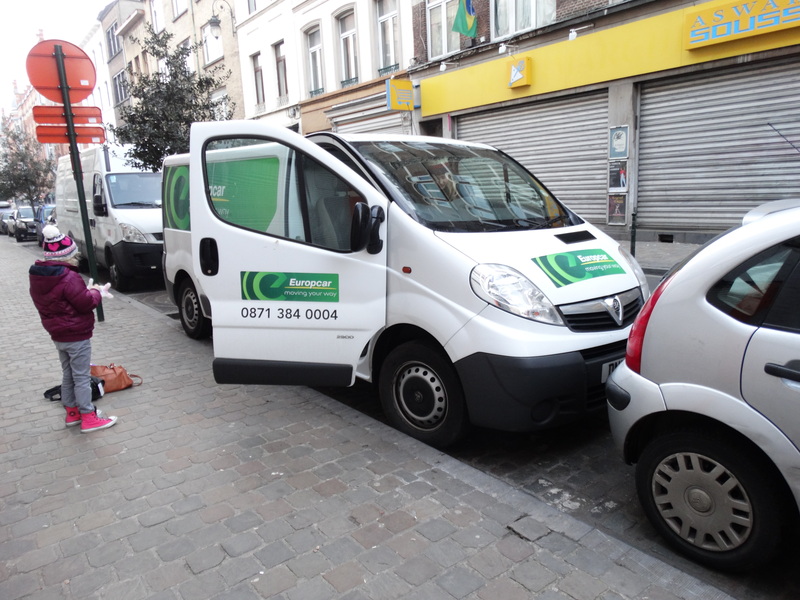 This was where the friendly Belgian tramp came into play, helping with my first ever van reverse park! 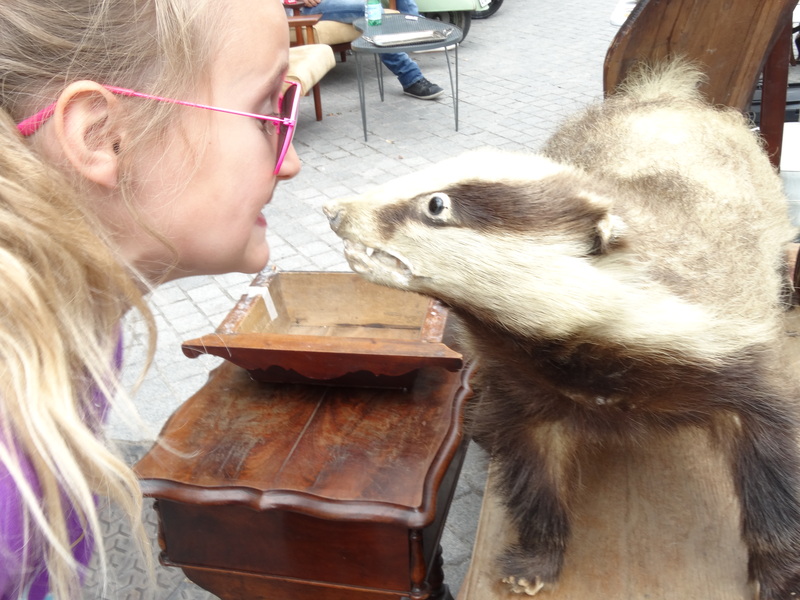 My excitement was quickly crushed though- the market was RUBBISH! and that is exactly what they were selling. I’ve never seen anything like it- I can’t believe that anyone would want to touch that stuff let alone give money for it and take it home. Where they found all this Sh*t from I’ll never know. Why would anyone want to root about in this? 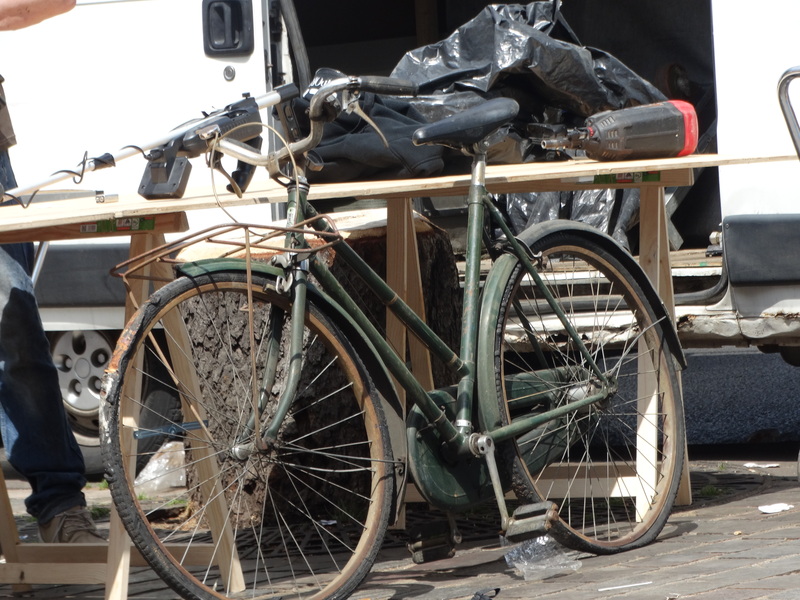 I like other people’s junk but this is a step too far! 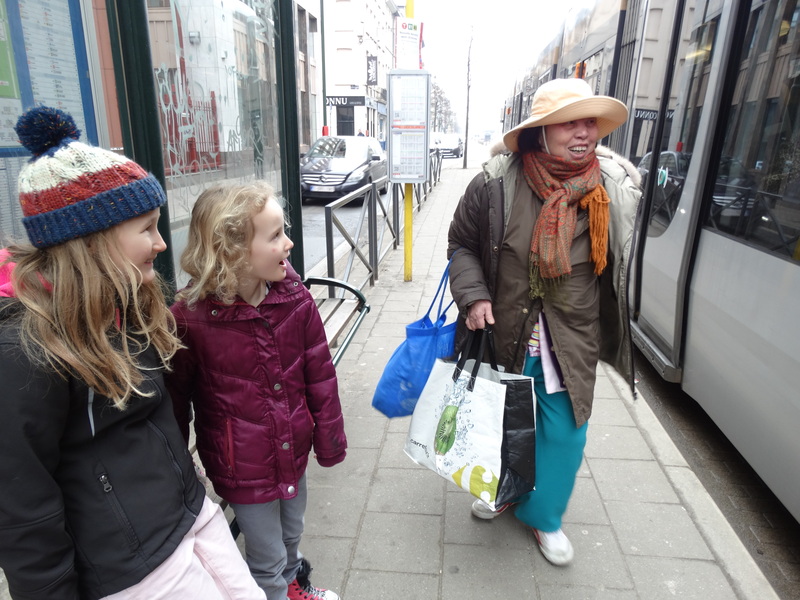 Look at the expression on Hazel’s face as the happy lady approached singing extremely loudly! 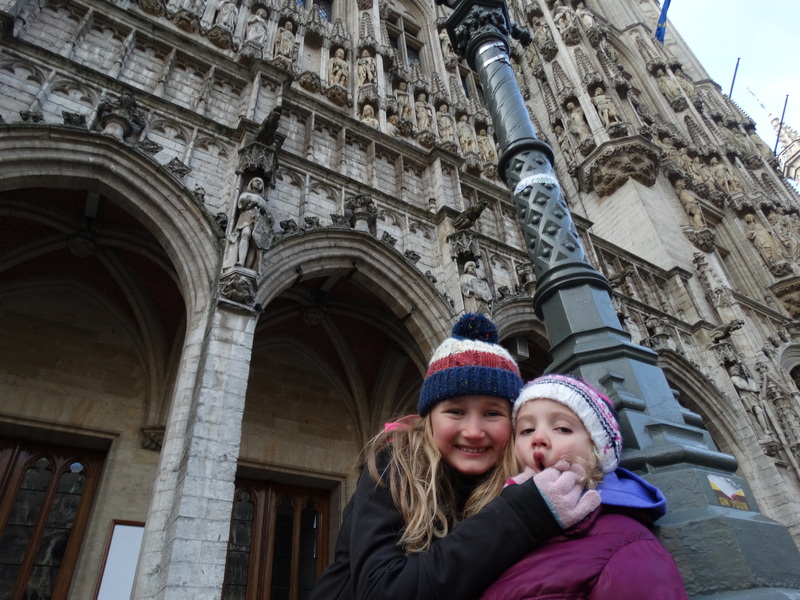 We had a nice day in Brussels. Met a mental woman on the tram (who, because she boarded the tram with us and stood with us for the first part of the journey everyone assumed was with us! 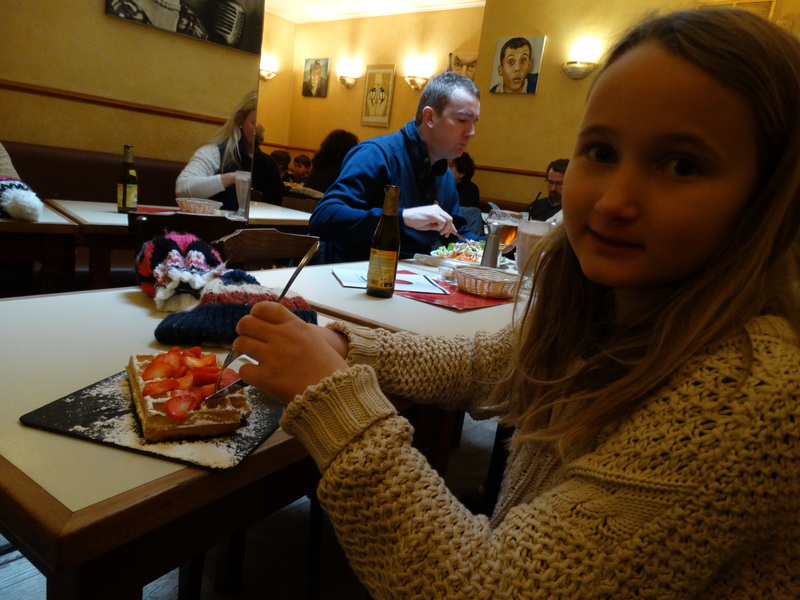 ), ate waffles for lunch and paid 29euros for the car park. The girls spent the whole day of some sort of sugar high like wild animals after a kind (?) shopkeeper gave them both a free lolly in the shape of the facebook ‘like’ symbol. 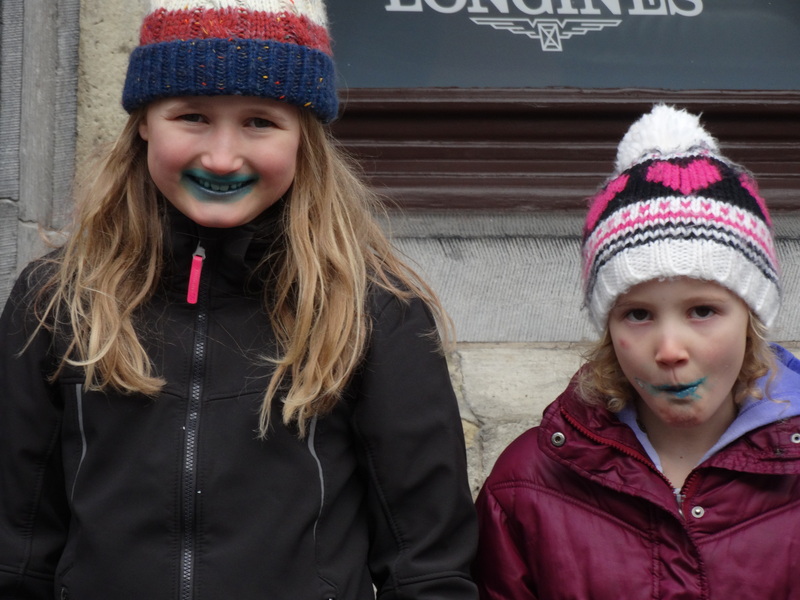 This also tainted the photos somewhat because they both had blue beards and tashes from the blue colouring. I’m not sure it will ever come off their perfect little faces! If it did this to their little faces, what did it do to their insides??! The following day was Hazel’s 7th birthday and after the present opening ceremony and a fairly lazy breakfast- ruined by a tantrumming child allowed to run free around the breakfast room by his parents (I don’t ever remember my two ever doing that in a public eatery and I’m fairly sure if they had I would have removed them!) we headed to Butte du Lion for a small amount of education- mainly for my benefit. 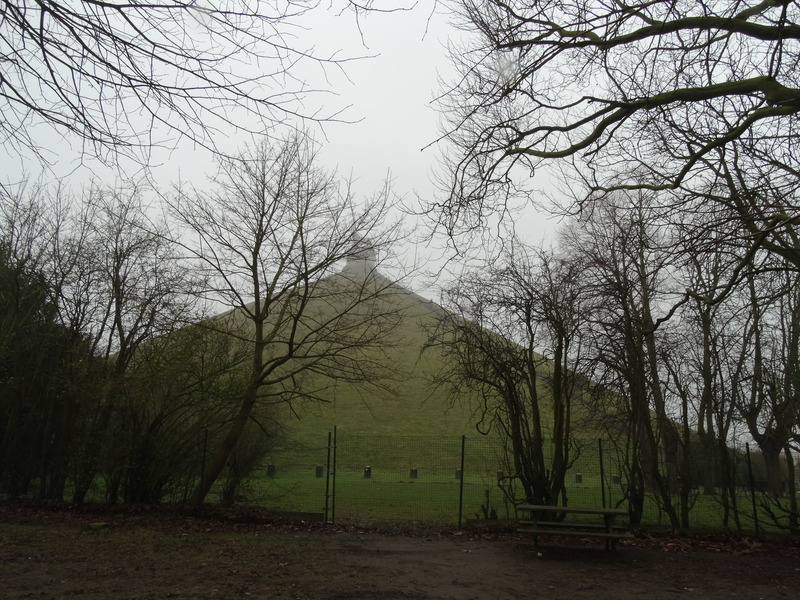 This is located in Waterloo and is a lion statue on top of a mound overlooking the field in which the battle of Waterloo took place. 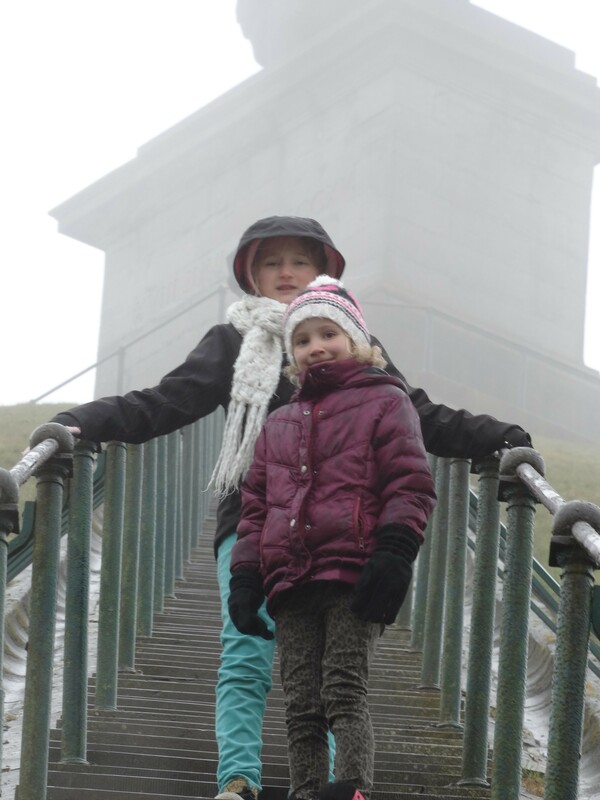 We climbed the 226 steps to the top then descended immediately. Anyway, the point to including this little snippet of un-furniture related information is that after driving to Waterloo it became evident that the Carrefour car park the sat nav had taken us to was probably not in Waterloo and was why we didn’t find an amazing flea market there. Next time I will use the quaint old fashioned navigation method-a map. 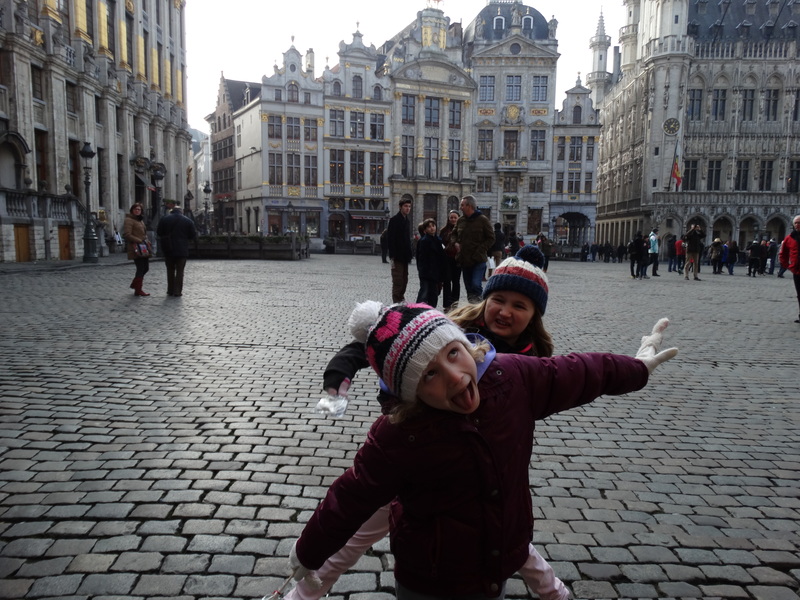 Another unrelated piece of info in case you are ever travelling to Brussels with kids check out Ocenade. 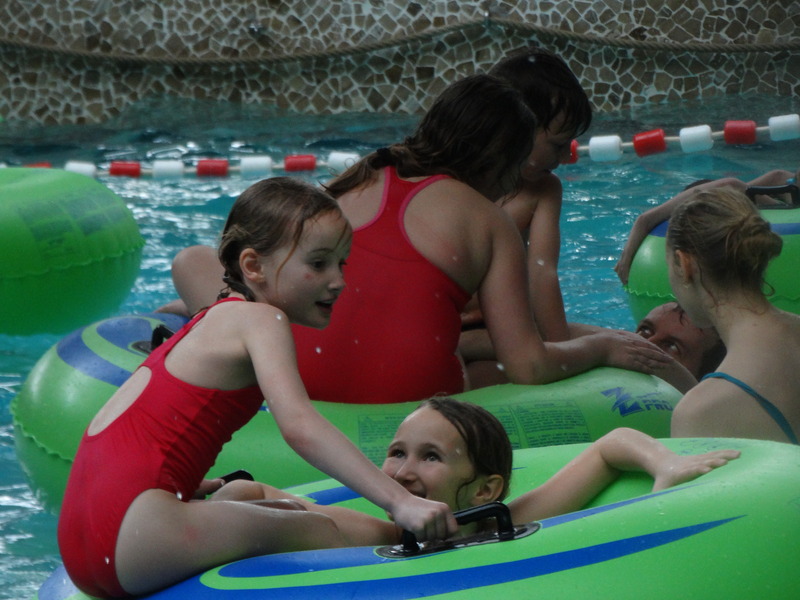 It’s an excellent swimming pool with an indoor beach, wave machines, climbing frames in the pool, waterslides. My girls loved it. They didn’t really attempt any slides except one Hazel fancied that looked fairly innocuous. It was outside and I stupidly assumed the drop pool would be heated to some level. It turned out that this innocent-looking little blue slide was a drop slide and I acquired the most painful wedgy on hitting the sub-zero icy water I have ever had-and that is saying something-my brothers have given me some life threatening wedgies in the past! 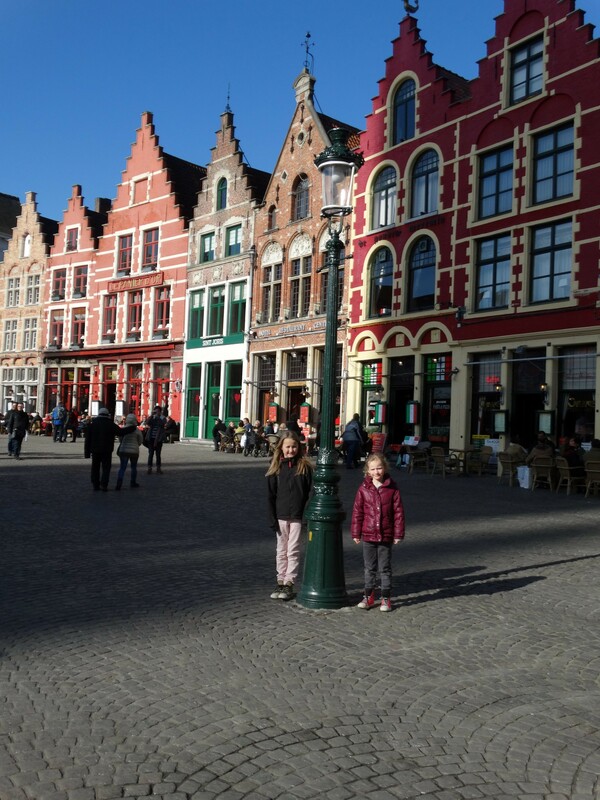 On Wednesday we paid a visit to Bruges- until that point Belgium hadn’t really won me over. 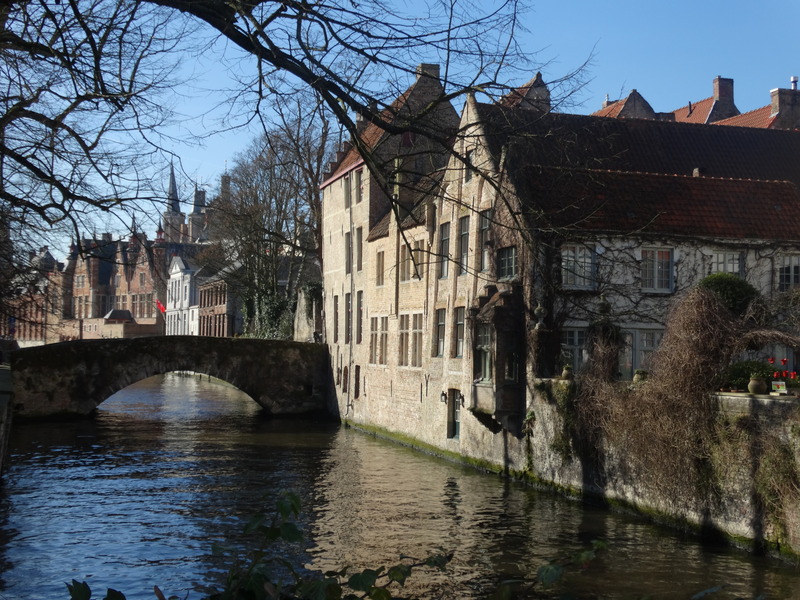 Bruges is beautiful. So, for the three days prior to setting off en route to Belgium whenever I drove my car anywhere I practiced not using my rearview mirror. It was a real shame I couldn’t practice driving on the right hand side of the road but my health and safety trainng told me that this was potentially hazardous. To my horror I found it almost impossible not to smeak a quick look in the rearview mirror whenever reversing which caused my fear levels to rise a fair bit! I very carefully planned what to pack because I am notoriously bad at packing. I always have to go out shopping to buy all the essentials I had deemed unnecessary at the suitcase loading stage. I also never fail to amaze myself at what I decide are a necessity at this same point. The sat nav app I downloaded – Here– I think it’s called got us to the van hire in Southend. I downloaded the maps for France and Belgium (only remembering France after a horror story from my friend Ruth who forgot to download one of the countries she was going to be driving through, but not stopping in on a road trip through Europe, only for the app to take her all the way round the forgotten country!). The app works on GPS so doesn’t use your data- at least that’s what I think happens! Getting the car out of the teeny car park at the hire place was extremely stressful. My ‘no rearview mirror’ training proved ineffectual because people kept driving behind me and stopping- I swear they were doing it on purpose! My palms were sweating and I was actually shaking. I had to perform a very tight left hand turn to get passed a Ka and when waiting to turn right onto Suthcuhurch road I paused to manually wind down the window and a waiting pedestrian actually said to me ‘your first time in a van?!’. 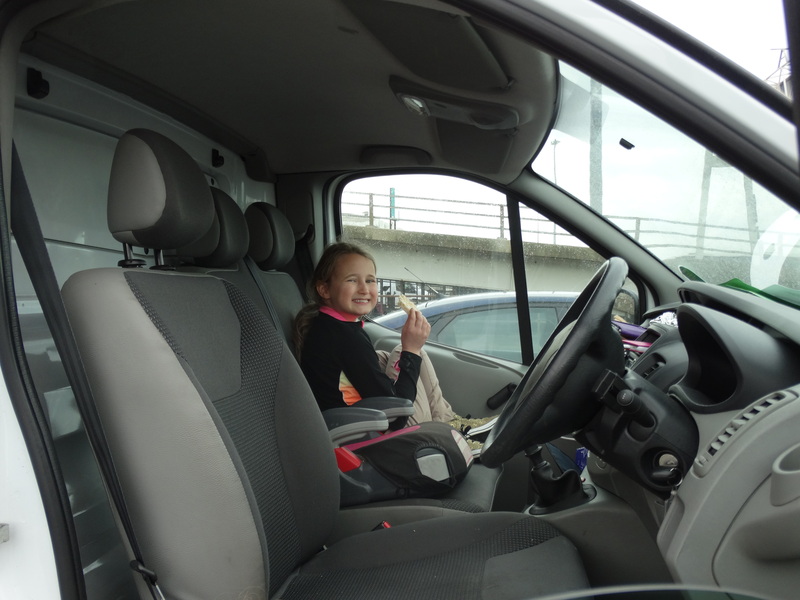 Nervously navigating the van through Southend…. Once on the open road however my palms dried out, my temperature returned to normal and I quickly assumed the persona of a white van man, stopping just short of peeing in a bottle and lobbing it out of the window! 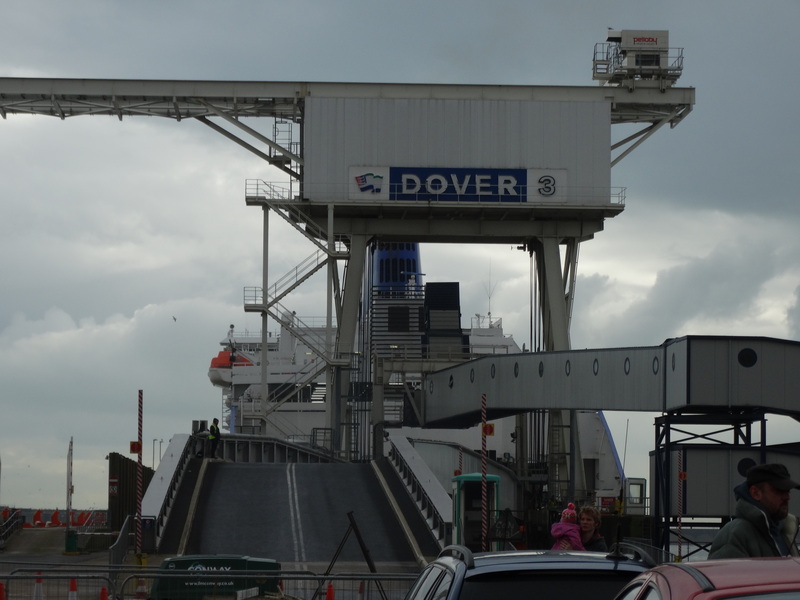 The drive to Dover was uneventful. But it never occurred to me that the man at passport control would think I was trying to abduct two small girls because I hadn’t changed my passport into my married name and our surnames didn’t match. He wanted evidence such as their birth certificates which clearly I hadn’t bought with me. One look at Scarlett should have told him she was mine at least! I was about to get into a real flap until he told me a photo of the girls and myself on facebook was sufficient to prove I was not a child abductor! 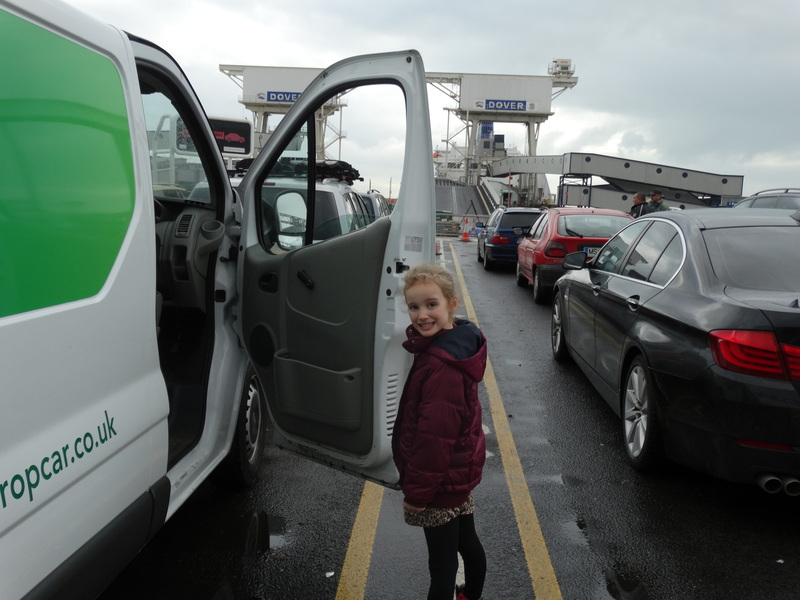 Thankfully I didn’t need to reverse the van into a tiny spot on the ferry- not sure why I thought that would be required! 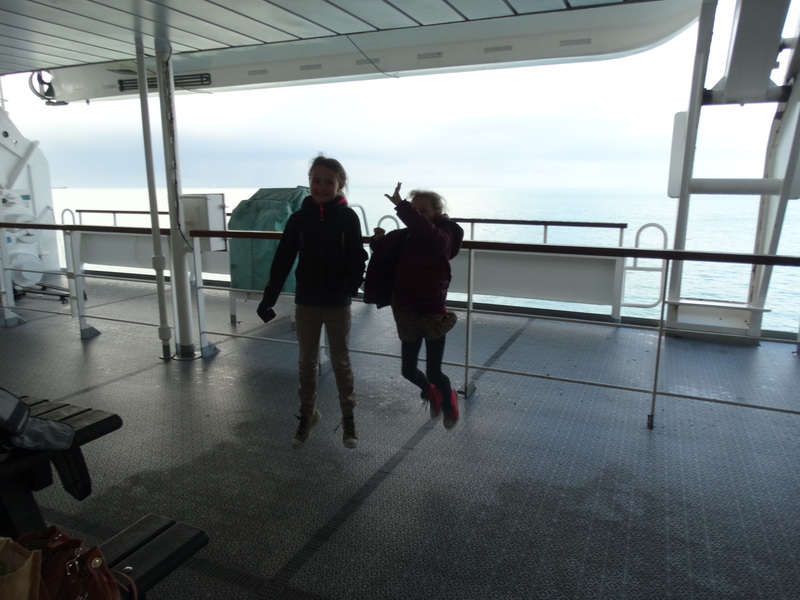 After a cup of tea (what I really wanted was a vino), one nose bleed (I didn’t pack the nose bleed towel), an entire pack of salt and vinegar snack a jacks and some geeking off on the outside deck we docked at Dunkirk. Scarlett was really shocked to find that everyone wasn’t stuffing their faces with snails. I had been concerned how she might react on French soil after I stupidly told her that burglers only existed in France one night a couple of years back when she wouldn’t sleep becuase she was worried about burglers. Luckily the snail thing averted her attentions! Driving on the other side of the road came easier than I thought and the journey to Belgium passed fairly quickly while we covered topics such as ‘what would happen if the world stopped turning’ (Hazel), ‘which sweets do you prefer out of the bag of teeth and lips- the lips or the teeth?’ (Scarlett). I parked the van at the hotel smoothly with a little help from a passing Belgian. I always worry when things go this smoothly and then it came back to bite me! We were heading to the bar so I could enjoy a well deserved vin and I forced Scarlett into the lift. She is really scared of most things including lifts. I told her it would be fine. It wasn’t! For the first time in my life we got stuck in a lift! I thought at first the doors were a little slow in opening. We waited. They didn’t open. I thought I heard voices so thought we must have been on the ground floor. I forced open the doors only to expose the inside mechanics of the lift. By this point Scarlett was hysterical, Hazel was beginning to panic and I wasn’t particularly comfortable with the situation. After hammering on the alarm and the lift door someone outside prised them open. We were between floors and had to jump down to safety! I proceeded to more or less down a large glass of vin! I am going to start my own business! And I am going to record it all in a blog! 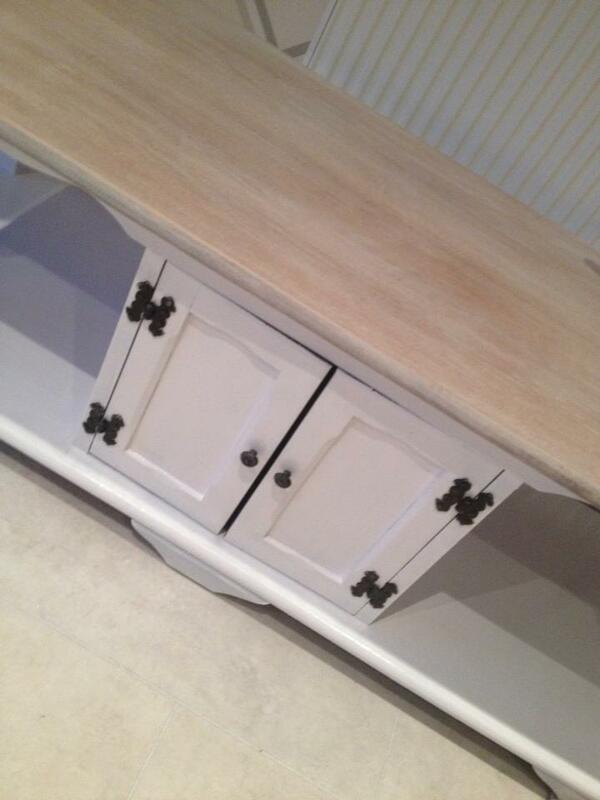 When I say ‘start my own business’ I really mean develop my side line Kplan Furniture. A decision made out of necessity after my career as a biomedical scientist in the NHS was rudely snatched away from me by a private company who prefer money over their staff. Although I still have a job, the lab will be moving to a highly inconvenient location and I didn’t sign up for an hour long commute to work when I moved mine and my girls entire life to Leigh-on-Sea for the senior biomedical scientist post 5 years ago. 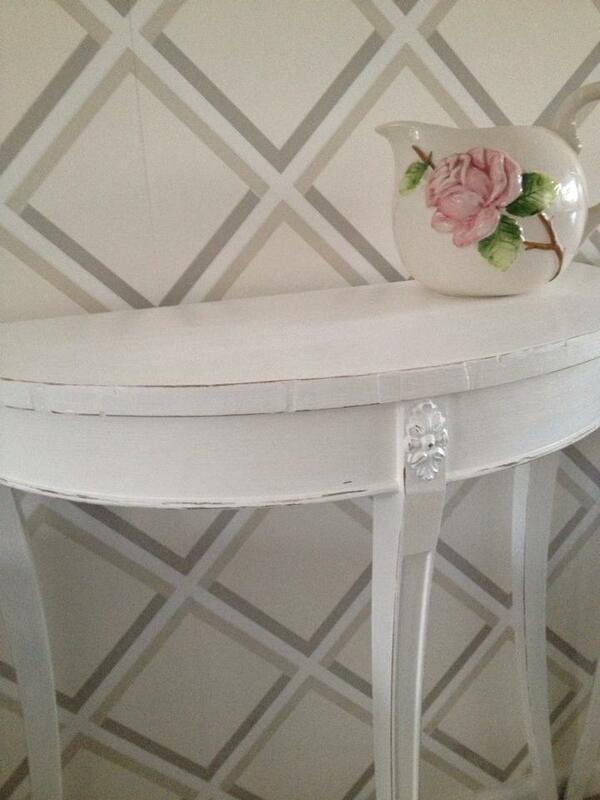 I’d been painting a few bits of furniture here and there when people off loaded their unwanted bits onto me for a bit of pocket money now and again but what I really have in mind is big beautiful solid pieces of antique furniture that can be restored to their original beauty with a bit (or possibly a lot) of TLC. 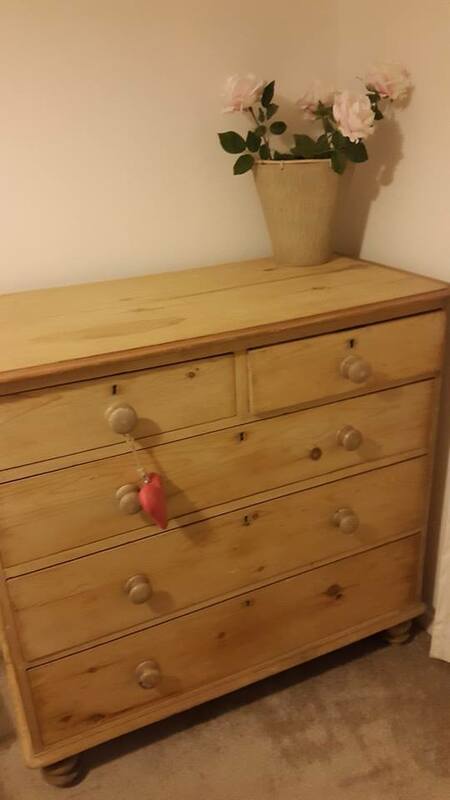 I’ve always loved furniture and interiors-used to spend hours as a child carefully cutting out pictures of beds and chest of drawers and filing them with my numerous colour charts I’d accumulated from visits to Do-It-All. After one of my episodes of intense moaning and a few tears (of which there have been loads) I decided on a visit to citizen’s advice to see if I gave up work all together whether I would be entitled to any sort of benefit at all to tide me over while I worked on developing Kplan. As I probably already knew but chose to be slightly hopeful, because I had worked and always paid my tax contributions I would be entitled to exactly NOTHING. The very helpful lady- Pam I think her name was- did point me in the direction of some websites and set me up with a telephone appointment with a business advisor from gov.co.uk. I went home armed with the websites but I honestly thought I wouldn’t bother looking at them (I was still in self pity/destruction mode at this point). But for some strange reason I decided I’d look at the Chamber of Commerce website (www.essexchambers.co.uk). Something I’d heard of but never gave what it was any sort of thought-but it turns out it’s all about promoting and protecting local businesses. Annoyingly I just caught the tail end of some government funded free courses based on starting your own business. I guess these courses are aimed at the unemployed to get them to start a business thus reducing unemployment stats. I did book onto a course called ‘starting an online business’ though. Still feeling a bit rubbish at this point. Then, completed unrelatedly, because my friend Charlotte had started a new diet and had lost loads of weight I decided to give that a go too because I’d been getting gradually rounder by the day- which gave me something else I could moan and whinge about. And I never imagined how AMAZING it would be! I feel soooooo much better both physically and emotionally (doubling the happy pills possibly also had a small part to play)- and I now feel mega excited about trying to develop KPLan! So the online business start up course happened last Wednesday. The main thing I took away was how important a blog can be for both marketing, documenting my journey and maybe to be of some help to others who may be in my position. So here it is! I said to my boyfriend a couple of hours ago- I’m not great at writing and English was my worst subject at school- I was better at French and it’s not even my actual language. He did point out that I am always correcting his grammar in his texts and that my blog might be ‘content slim’ but at least it will be ‘grammatically heavy’!! I enjoy the word of the day by email as well so I may attempt to slip one or two in here- maybe you can spot them?! Tantara. Another couple of things I learnt about and will be exploring in the very near future are Stakeholder Mapping which I believe is another term for stalking and Search Engine Optimisation. All very important since it’s all well and good having a wonderful website but not so good if no one ever visits it. I will keep you posted with my findings. Oh and #’s! Just beginning to learn about them. I’d only ever had experience of them in derogatory texts from my ex-husband before and found them quite amusing #justsaying at the end of an insult was my favourite and now most famous amongst my friends. Turns out this is not how you use them! They are more usefully used to group related topics on social media sites. I’ll hopefully have used few by the time I write my next blog- will let you know how it goes! I am hoping to get involved in Pinterest and teach myself how to use Twitter. 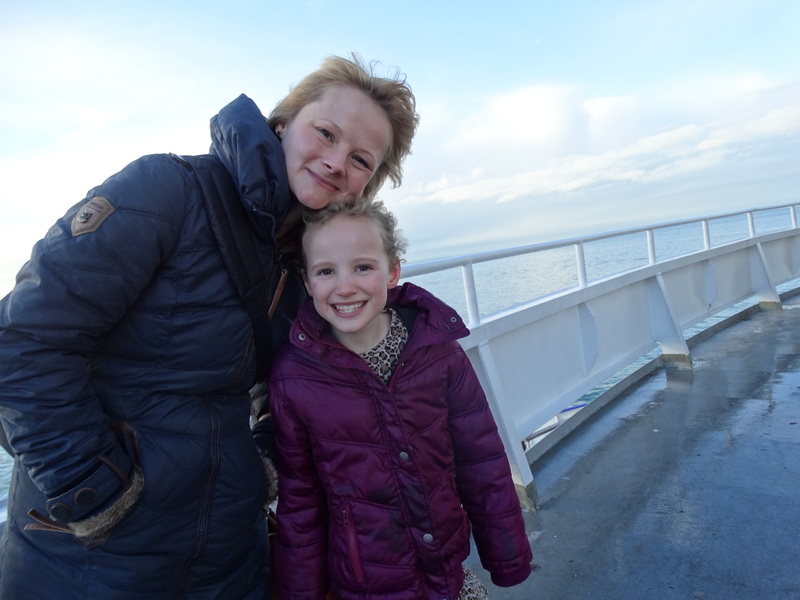 But most importantly of all I have an adventure planned for my 2 girls and I. I will be loading them into the back of a van next Saturday and setting sail to Belgium in search of Flea Markets. I have this idea that I’ll be able to source lots of lovely beautiful antique furniture all ready for me to lovingly restore to sell! However the idea at the moment is scaring me sh@#less- driving a transit for the first time and not only that on the other side of the road in a country I’ve never been to, not helped by my current colleagues agreeing that they were also scared for me! If I make it home, I will tell you all about it!